The Luminous Veil on Toronto's Prince Edward Viaduct prevents people from jumping from that bridge, but has not been shown to affect overall citywide jumping suicide rates. The following is a list of current and historic sites frequently chosen to attempt suicide, usually by jumping. Some of the sites listed have installed suicide barriers, and other precautions, such as crisis hotline phones. Exact numbers of victims are sometimes difficult to determine, as many jurisdictions and media agencies have ceased collecting statistics and reporting suicides at common sites, in the belief that the reporting may encourage others. Prince Edward Viaduct, Toronto, Ontario — 492 suicides before the Luminous Veil, a barrier of 9,000 steel rods, was constructed. Van Stadens Bridge, Eastern Cape, South Africa — 88 suicides since construction in 1971. Nanjing Yangtze River Bridge, China - over 2,000 suicides since 1968, ~50/year. Mount Mihara, Japan — an active volcano on the island of Izu Ōshima. After Kiyoko Matsumoto jumped into the crater in 1933, media reports led to hundreds of copycats until 1936, when access was restricted. Tehran Metro, Tehran, Iran According to authorities, each month at least 1 suicide occurs in Tehran Subway. Milad Tower, Tehran, Iran Until 2012, 3 persons died by suicide by jumping from Milad Tower. Erskine Bridge, Erskine, Scotland, United Kingdom. Clifton Suspension Bridge, Bristol, England, United Kingdom — more than 500 suicides since opening in 1864. Suicide barriers were installed in 1998, which halved the suicide rate over the years following. Segovia Viaduct, Madrid, Spain — colloquially called the suicide bridge, starting from the 17th century until the 1990s, when it saw fatal falls at an average of one a week. A barrier was erected in 1998. Humber Bridge, Kingston-upon-Hull, England, United Kingdom — more than 200 incidents of people jumping or falling from the bridge took place in the first 26 years after it opened in 1981, with only five surviving. Grand Duchess Charlotte Bridge, Luxembourg City, Luxembourg — more than 100 suicides since opening in 1966. Since 1993, a Plexiglas barrier has prevented people from jumping off the bridge and falling on top of the houses below. Göltzsch Viaduct, Reichenbach im Vogtland, Germany — exemplary attraction for attempting suicide in Germany, under continued supervision by the Federal Police, scene of a 2001 suicide pact that led to the 2002 documentary Teuflische Spiele (Diabolical Games). Archway Bridge, Highgate, London, United Kingdom. Nusle Bridge, Prague, Czech Republic - At least 365 deaths. Paris Métro, Paris metropolitan area, France - 20 to 40 deaths per year. Golden Gate Bridge, San Francisco, California — official count halted at 997 to prevent "record breakers"
Colorado Street Bridge in Pasadena, California has been the host of numerous falls/jumps starting as early as its construction, when a worker who had been drinking fell off the bridge into wet cement. It has hosted many suicides since, and a large barrier/fence has been installed to keep people from jumping. George Washington Bridge between New Jersey and New York City — It has been averaging around 10 suicides per year and a record 18 in 2012. 18-year-old Tyler Clementi also jumped from the bridge in 2010 after being bullied. Sunshine Skyway Bridge, Tampa Bay, Florida — At least 130 people have died by suicide by jumping from the center span into the waters of Tampa Bay since the opening of the new bridge in 1987 and an estimated 10 others have tried, but survived. In response, the State of Florida installed six crisis hotline phones along the center span in 1999, and began 24-hour patrols. As of 2003, the call center had received 18 calls from potential jumpers, all of whom survived. However, the total number of jumpers has not significantly declined since the introduction of these safeguards. The song, "Skyway Avenue," by We The Kings is about two lovers who decide to jump to their deaths together from this bridge. Prince Edward Viaduct, Toronto, Ontario — A suicide barrier was installed in 2003. Jacques Cartier Bridge, Montreal, Quebec — more than 143 suicides. Suicide barriers were erected in 2004. Niagara Falls — between 1856 and 1995 there were 2,780 known suicides; and there are 20 to 25 per year. Tappan Zee Bridge, Tarrytown, New York — more than 30 suicides between 2002 and 2012; sometimes referred to as "the Golden Gate Bridge of the East"
Toronto Transit Commission subway and rapid transit network — 150 people have killed themselves, and there have been an additional 100 attempts between 1998 and 2007. The Natchez Trace Parkway Bridge in Franklin, Tennessee is a suicide bridge that is the site of at least 30 completed suicides since 1993, as of January 2018. West Gate Bridge, Melbourne — Has "up to one" suicide every three weeks. Suicide rates on the bridge have dropped by 85% since prevention barriers were installed by the state government in 2009. Grafton Bridge, Auckland, New Zealand — suicide barriers were removed in 1996 after being in place for sixty years but replaced in 2003. Lawyer's Head, Dunedin, New Zealand. Eduardo Villena Rey Bridge in Lima, Peru. The bridge had to be covered with large windows due to suicide rates. The street under the bridge is believed to be haunted. São Paulo Metro, São Paulo, Brazil. The São Paulo Metro system transports about 4.6 million people a day. The São Paulo Metro, as other subway networks in Brazil, have a policy not to publicly disclose the number of suicides taking place in any given period. It is not uncommon for fellow passengers to see people jumping off the platform as trains approach the station. Train-drivers, security staff, emergency services, and rail workers are trained not to discuss suicides taking place in the subway system. There is a common belief that by not disclosing suicide statistics to the general public, Metro networks prevent further occurrences to take place. Third Bridge, Vitória, Brazil. The construction of a suicide prevention net is currently being discussed by public authorities and the concessionary of the bridge. ^ a b Bone, James (13 October 2008). "The Times" (ECE). New York. Retrieved 23 October 2008. ^ a b "World's 10 most popular suicide destinations". retard zone. 27 August 2008. Retrieved 23 October 2008. ^ Basson, Monique (11 October 2012). "DA calling for safety measures". Kouga Express. Retrieved 15 October 2012. ^ "Ponte City text / MIKHAEL SUBOTZKY ARCHIVE". www.subotzkystudio.com. ^ Ellis, Edward Robb; Allen, George N. (1961). Traitor within: our suicide problem. Doubleday. pp. 94–98. OCLC 445487. ^ "Those who chose Milad Tower to commit suicide". Parsin News. 24 April 2015. Archived from the original on 20 February 2016. Retrieved 4 March 2016. ^ Fitzgerald, Todd (28 March 2016). "Mum's agony over tragic son who was discharged despite suicide threat". Manchester Evening News. ^ "TfL Freedom of Information request detail: Underground Suicide Data". 27 August 2017. ^ "Suicide jump child 'already dead'". BBC News Online. BBC. 2 June 2009. Retrieved 2 June 2009. ^ "Effect of barriers on the Clifton suspension bridge". 6 June 2006. ^ "El Viaducto de Segovia y los suicidios en Madrid , historia". 30 June 2014. ^ "Bridge jump attempts prevented". BBC News. 13 June 2007. Retrieved 26 June 2010. ^ "Le pont rouge, a suicide bridge - The World Wide Panorama". ^ Deegan, Gordon (21 January 2009). "Rangers stop four cliff suicides". Irish Independent. ^ "Tragedy of 90 deaths at suicide blackspot bridge". Herald.ie. ^ Jõgeda, Tiina (17 January 2008). "Türisalu pank – enesetaputuristide Meka". Eesti Ekspress (in Estonian). ^ Proske, Dirk (2004). Katalog der Risiken: Risiken und ihre Darstellung (Risk catalogue: Risks and their representations). Dresden: Eigenverlag. P. 146. Chap. 1.5: Soziale Risiken (Social risks), paragraph 1.5.1: Suizide (Suicide). ^ Spiegel Online (2002). Wie eine Brücke zur Attraktion für Selbstmörder wurde (How a bridge becomes an attraction for suicide). Retrieved 3 April 2011. ^ zero one film (2011). 2002: Teuflische Spiele Archived 22 March 2012 at the Wayback Machine. Retrieved 3 April 2011. ^ "Petição Ponte Segura - pelo fim dos suicídios na ponte 25 de Abril". ^ "Mladík (†25) skočil z »Nuseláku«". AHA.cz. ^ "INFOGRAPHIE - RATP : une trentaine de personnes meurent chaque année dans le métro ou le RER parisien". ^ Hagstrom, Suzy (12 October 2000). "Through the Air into Darkness". San Diego Reader. ^ Zabriskie, Phil. "The Mysteries of the Suicide Tourist". New York Magazine. New York Media LLC. Retrieved 13 April 2012. ^ Messing, Philip (14 January 2013). "Sad GWB suicide record". New York Post. Retrieved 14 January 2013. ^ Priscilla Long (14 March 2003). "Seattle's George Washington Memorial Bridge (Aurora Bridge) is dedicated on February 22, 1932". HistoryLink. Retrieved 15 January 2008. ^ Jones, Jamie (6 October 2003). "Skyway safeguards don't deter jumpers". St. Petersburg Times. Retrieved 1 February 2007. ^ "Song Meanings: Skyway Avenue". songmeanings.com. ^ "La barrière anti-suicide a prouvé son utilité" (in French). Le Devoir. 10 September 2007. Retrieved 25 August 2008. ^ "Foresthill Bridge scene of suicide plunge". 20 October 2009. Retrieved 5 November 2010. ^ "Foresthill Bridge". 3 December 2007. Archived from the original on 5 May 2009. Retrieved 5 November 2010. ^ Janiskee, Bob (16 September 2008). "At New River Gorge National River, an Iconic Bridge Attracts Suicide Jumpers". National Parks Traveler. Retrieved 17 October 2015. ^ Tyson, Daniel (25 August 2015). "Man dies after jumping from New River Gorge Bridge". Fayette Tribune. Register-Herald.com, The Register-Herald. Retrieved 17 October 2015. ^ Hudson, Mike (27 May 2008). "Suicide season". Niagara Falls Reporter. Retrieved 5 January 2011. ^ Ho, Sally (16 June 2012). "TriMet's Blue, Red lines delayed after fatal fall from Vista Bridge". The Oregonian. Retrieved 2 September 2012. ^ O'Connor, Timothy (14 October 2012). "High anxiety: Trooper fights fear to save would-be Tappan Zee jumpers". Newsday. Retrieved 16 October 2012. ^ Torontoist (26 November 2009). "Subway Suicide Statistics Released". ^ Zittrer, Janna (15 April 2004). "Stopping the suicide train". ^ "Middletown mayor looks to curb suicides on Arrigoni Bridge". 18 August 2015. ^ "Connecticut pursuing safety measures to prevent jumpers on Arrigoni Bridge". 29 July 2015. 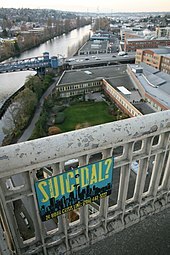 ^ "Bridge renowned for beauty in its setting and design also known for suicides". Spring Hill Home Page. 7 January 2018. Retrieved 22 October 2018. ^ Turnball, Malcolm (24 March 2010). "Tragedy amid the beauty at The Gap". The Sydney Morning Herald. Retrieved 5 January 2011. ^ Mark Dunn; Anthony Dowsley (14 June 2008). "Anti-suicide barrier urged for West Gate Bridge". Herald Sun. Retrieved 5 January 2011. ^ Beautrais, Annette L.; Sheree J. Gibb; David M. Fergusson; L. John Horwood; Gregory Luke Larkin (June 2009). "Removing bridge barriers stimulates suicides: an unfortunate natural experiment" (PDF). Australian and New Zealand Journal of Psychiatry. 43 (6): 495–497. doi:10.1080/00048670902873714. Archived from the original (PDF) on 23 May 2010. Retrieved 18 August 2010. ^ Amorocho, Carlos (12 April 2012). "El viaducto de los suicidas" (in Spanish). Vanguardia Liberal. ^ "Zona de Miedo: Los Fantasmas de Barranco y el Puente Villena". ^ Magesky, Lais (21 January 2019). "Capixabas escolhem projeto de barreira rebaixada para Terceira Ponte". Gazeta Online (in Portuguese). Retrieved 22 January 2019.